That cities will change is indisputable: urban evolution mostly signifies healthy growth, but it is also true that in the contemporary context, gentrifying neighborhood change increasingly operates on an extraterritorial plane, happening quickly, opportunistically and unilaterally. Neighborhoods are evaluated and disposed of as trading commodities in a process that violates the citizen’s fundamental right to the expectation of a stable dwelling situation. Gentrification also threatens a city’s spatial heterogeneity which, through its diverse forms and meanings, can support the enactment of democratic urban life. It leaves little room for a broader discourse around place – a discourse that might lead to the creation of more porous urban space, to the emergence of hybrid institutions and to new sites of pluralistic engagement. This paper will consider a pair of contiguous neighborhoods in Philadelphia where market-driven gentrification has come face to face with powerful grassroots civic advocacy; and it looks at what architects, landscape architects and urban designers can do to help neighborhoods resist gentrification and support heterogeneity in making places where the hand-print of multiple publics might be found. In cities where de-industrialization has left large segments of their populations in poverty, once stable working class neighborhoods are increasingly threatened by market-driven gentrification. Change happens as if over night, and longtime residents, finding their communities transformed in terms of economic class and race are subject to a rising cost of living and often pressured to move. With their departure, the local culture built up over time is eroded; cleansed of its unique qualities of place, it is replaced with spatial products of the dominant commercial culture. Here gentrification violates not only the citizens’ primary right to the city but poses a threat to the city’s spatial heterogeneity which, in its diverse forms and meanings can support the actualization of democratic urban life. That cities will change is indisputable: urban evolution mostly signifies healthy growth, but it is also true that in a contemporary context neighborhood change increasingly operates on an extraterritorial plane, happening quickly, opportunistically and unilaterally. With the invisible hand deftly at work, neighborhoods are evaluated and disposed of as trading commodities with “exchange value” rather than as mosaics of places for diverse constituencies. Lost in this singular profit model is the notion held by Lefebvre of the citizen’s right to appropriation including access, use and pleasure that constitute a broader conceptualization of ownership. 1 Gentrification and its tightly defined spatial and programmatic tropes leave little room for a broader discourse around place – a discourse that might lead to the creation of more porous urban space, to the emergence of hybrid institutions and to new sites of pluralistic engagement. This paper will consider a pair of contiguous neighborhoods in Philadelphia where market-driven gentrification has come face to face with powerful grassroots civic advocacy; and it looks at what architects, landscape architects and urban designers can do to help neighborhoods resist gentrification and support heterogeneity in making places where the hand-print of multiple publics might be found. The literature of gentrification – theories, processes, and social impacts – resides primarily in the realms of political science, sociology, urban studies and geography, addressing careful place-based studies through the lens of larger cultural and economic drivers. 2 These are serious critical analyses and by nature do not propose resolutions, especially not in material spatial projections that architects employ. But the consequences of gentrification are played out in actual physical space, so it is important that a discussion of the phenomenon that has radically changed neighborhoods worldwide be more fully explored in the literature of architecture and urban design practice. The corner store renovated as a café in a bike-friendly youthful environment are ubiquitous hallmarks of urban gentrification. Photo by Sally Harrison. A neighborhood survey engages designers and residents. Cultural patterns invisible to the outsider are experienced and recorded as part of the spatial inventory. Photo by Sally Harrison. The experiential map visualizes the place identity. Photo by Sally Harrison. Pausing to chat below a grafittied overpass, middle class urban pioneers are willing to take on “grittiness” in the name of authenticity and real estate bargains. Photo by Andrew Jacobs. There is an on-going debate between those who would tout the emancipatory nature of gentrification 10 versus those who condemn the “brutal inequalities and economic fortune that are produced in the process.” 11 The short-term effects of gentrification on so-called quality of life issues are often positive, and longtime residents have expressed mixed feelings about neighborhood change. The study of Harlem for example showed only minimal displacement, and many neighbors appreciated the improved amenities, reduced crime rate, school improvement and increased housing values. 12 But over time costs tend to outweigh the benefits in the form of increased taxes, rents and the influx of expensive retail making local shopping unaffordable. And the immeasurable costs are more subtle and affective. Observers like psychiatrist Mindy Thompson Fullilove have eloquently expressed the damage to the emotional ecosystem done by uprooting people from their homes. 13 Those who can afford to stay often suffer from feeling like a stranger in their own neighborhood where the social capital is found in familial ties and history. 14 And with this the dismantling of cultural patterns and neighborhood ethos come the development of new hip, socially exclusive establishments. 15 In a poignant capitulation to the commodification of the dwelling, residents will often sell out at a considerable profit only to find they cannot afford housing in as good a neighborhood and must again forge new communal bonds. 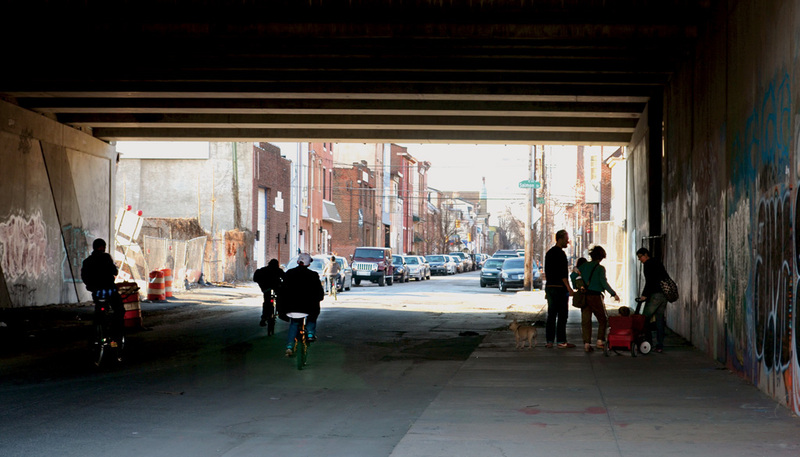 In this context we examine the emerging transformation of two adjacent neighborhoods in the Kensington area of eastern North Philadelphia. Research and design partnerships with both neighborhoods have been established over several years. 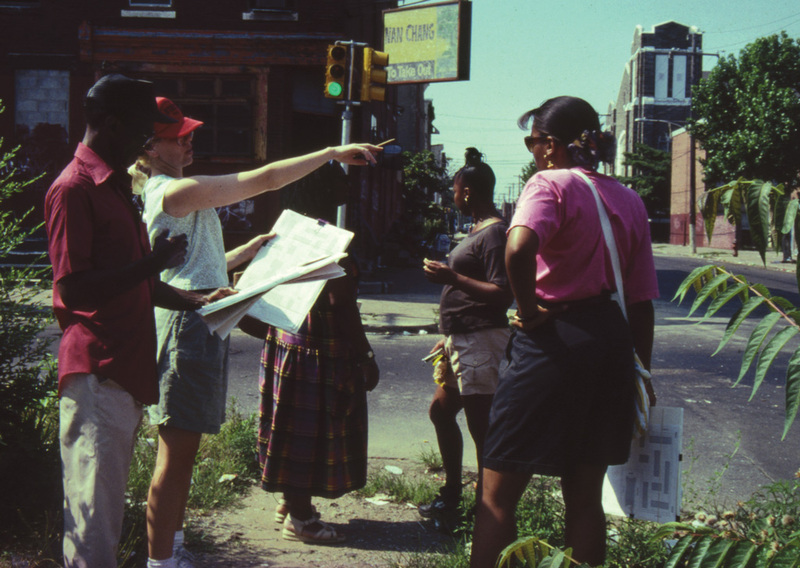 Questions of gentrification; shared and differing neighborhood agendas; and overlap and intersections of spatial claim have been explored through meetings and interviews with stakeholders, residents, leaders, and policy makers. 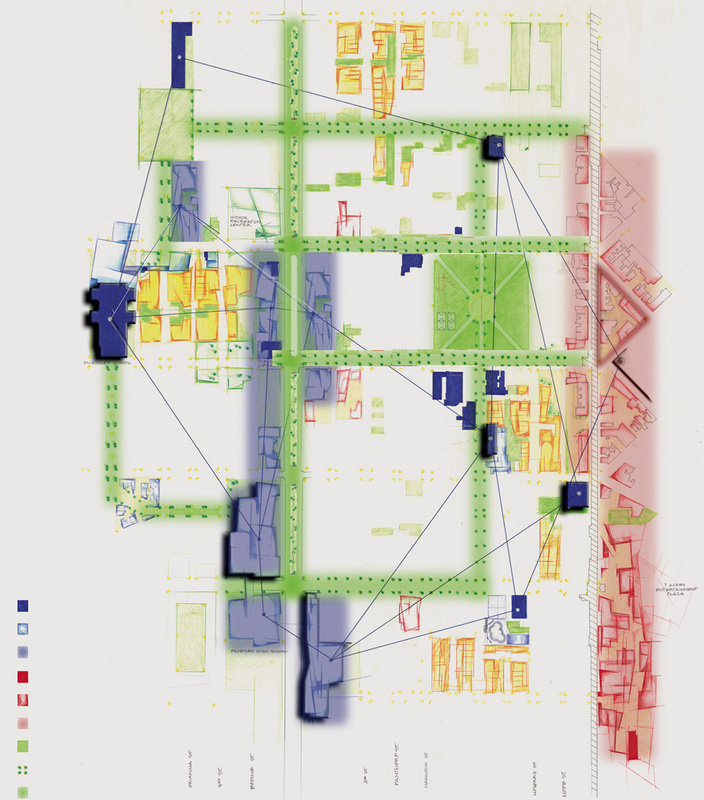 In addition, physical spatial analysis and projections have been undertaken through community-based studios in architecture and in a theis project in landscape architecture. 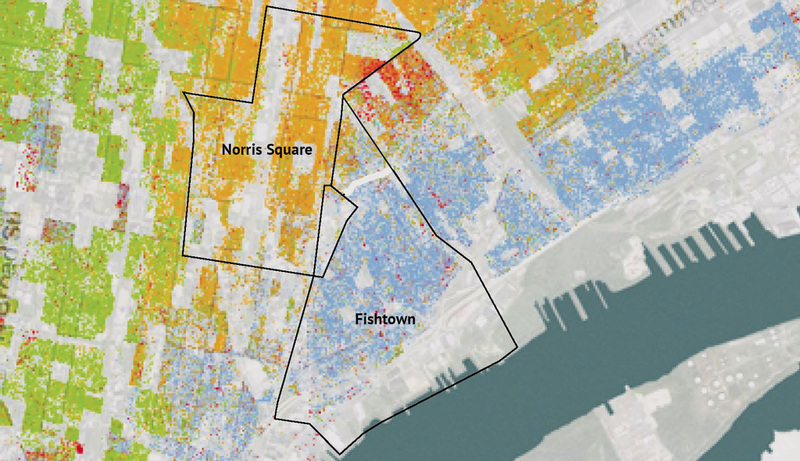 Racial dot map showing the dramatic divide along the Front Street corridor between Norris Square and Fishtown. The long triangular space in between the two neighborhoods was for years a "terrain vague." (Yellow: Latino; Blue: Caucasian; Green: African American). Image © 2013, Weldon, Cooper Center for Public Service, Rector and Visitors of the University of Virginia (Dustin A. Cable, creator). Below the El on the Front St. corridor. Photo by Andrew Jacobs. 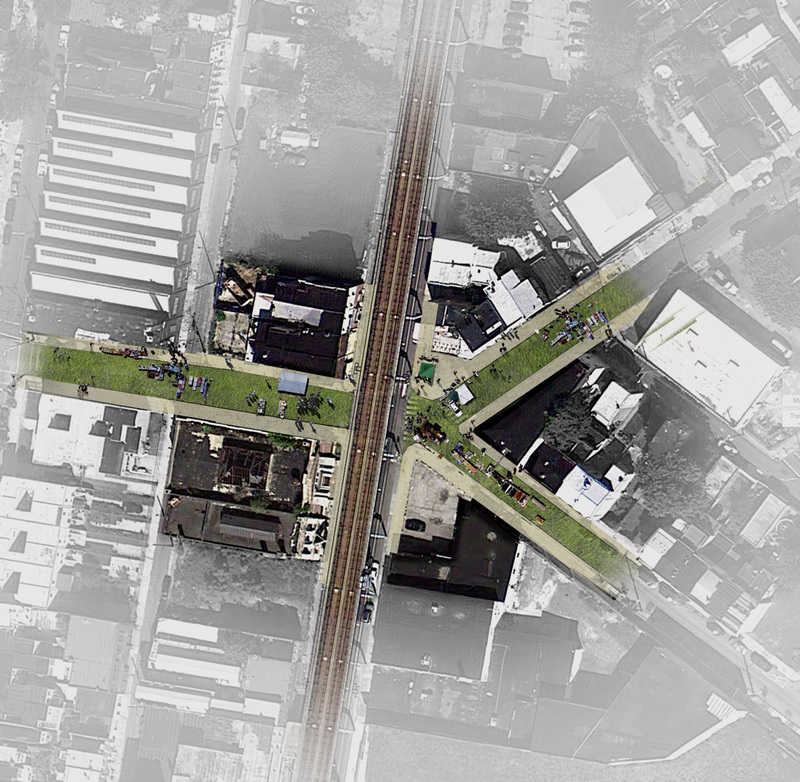 The Norris Square neighborhood is a product of Philadelphia’s rapid late nineteenth century century industrialization; after the late twentieth century industry collapse the neighborhood depopulated becoming known as the “Badlands.” Members of Puerto Rican community displaced by the publicly sanctioned gentrification of urban renewal resettled in this “ghetto of last resort” 16 drawn by the large square, a spatial anomaly in the otherwise undifferentiated gridiron layout of central North Philadelphia. The square, surrounded by struggling institutions and vacant brownstones was in the 1970s a famous drug market, but a group of young mothers bent on building the neighborhood into livable place for displaced Latino families, rallied the local Catholic church and police and occupied the park, holding midnight prayer vigils and peace marches, and gradually appropriated the space. 17 The community commands a remarkable identity-building amenity in the park, which is now well tended and a site for relaxation and active recreation, movie nights and community gatherings. La Parcelas, Norris Square. 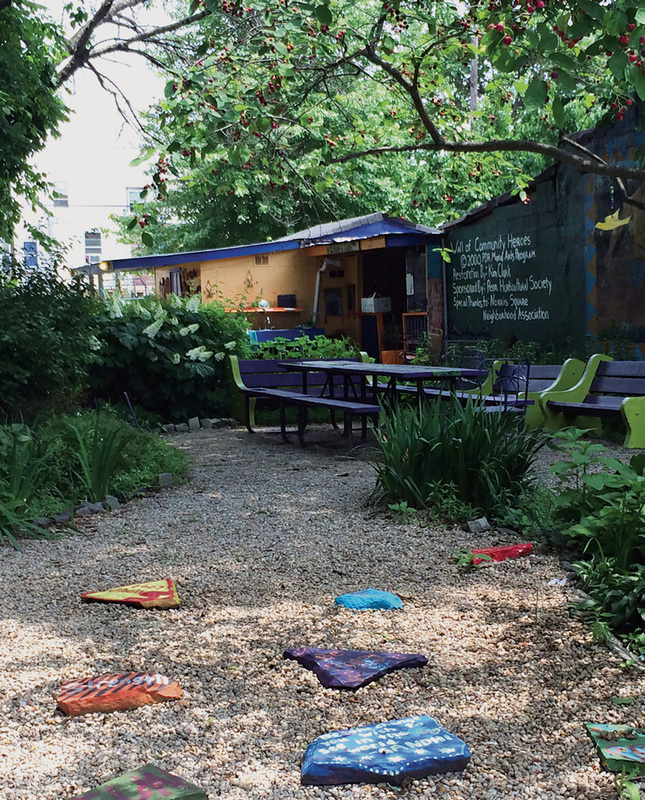 A garden built in vacant lots by a Norris Square community group, celebrating Latino culture and heritage. A casita houses everyday artifacts from domestic life in Puerto Rico and in its kitchen residents can prepare meals for celebrations. Photo by Sally Harrison. Bus shelter, Fishtown. 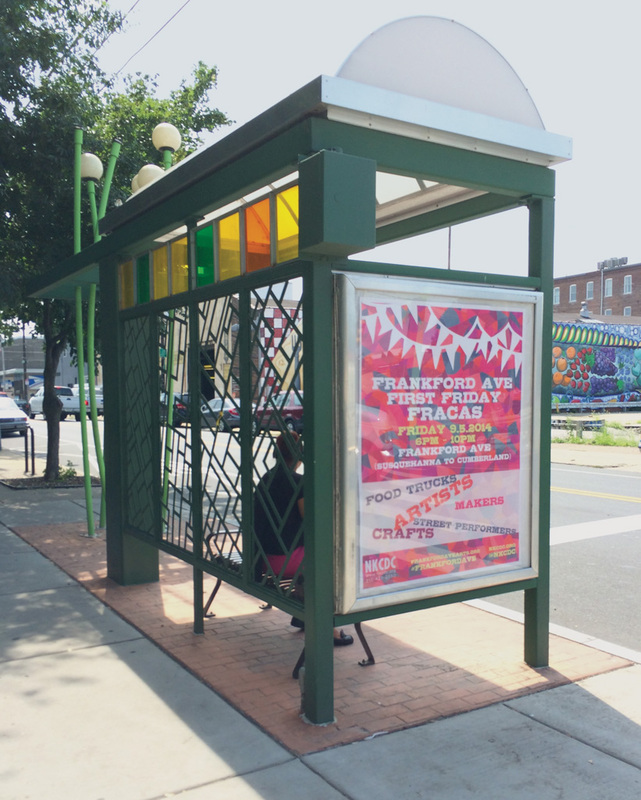 A smartly designed bus shelter branding the Frankfort Avenue Arts corridor proclaims First Friday, a monthly art event. Photo by Sally Harrison. Interactions between the two neighborhoods were rare, resulting from burnished physical as well as social conditions. Racial hostilities had been decades in the making. The collision of street grids at Front Street created a disorienting, discontinuous cross-movement network, a divide reinforced by the elevated rail, darkening the struggling commercial street below. A vacant seven-acre site that had been the terminus of a defunct rail line stretched along Front Street for several blocks toward the end of the commercial corridor expanding the divide between the two neighborhoods – creating a terrain vague filled with abandoned vehicles and inhabited by small colonies of homeless drug users. The only evidence of border crossing was a narrow beaten path connecting Fishtown to the El stop at Berks and Front Street. The path originated in a break in what was referred to as the Fishtown Wall – a four-foot retaining wall demarking the community boundary. A discussion map annotates places of value and conflict. But unable to achieve the financial support to develop the site, NSCA sold it to the school district. A magnet school for the creative and performing arts was finished in 2011 – a LEED platinum building that was part of the trend of urban greening that Fishtown had also eagerly adopted. With development funds from the water department the 7 acre site was branded “The Big Green Block” in the zip code “Sustainable 19125.” Virtuous as the sustainability goal may have been, and as appropriate to an inter-community scale a magnet school may be, it did little heal the divide between the two neighborhoods: the school and its elevated playing field fill the site, allowing no informal “loose spaces” that Stevens and Frank speak of that might encourage public encounter. 21 Even the passage to the El stop was swallowed up: a narrow footpath enwalled with chain link fence. In the end a project so potentially rich in opening up possibilities for building heterogeneous democratic city life, closed the door. Reinforcing a boundary, it became a victory for gentrification; new expensive housing filled in on longtime derelict lots adjacent to the Big Green Block, and developers began to eye land across Front Street. Fishtown continued rapidly gentrifying, with new row housing once valued at $100,000 being sold for five times as much. 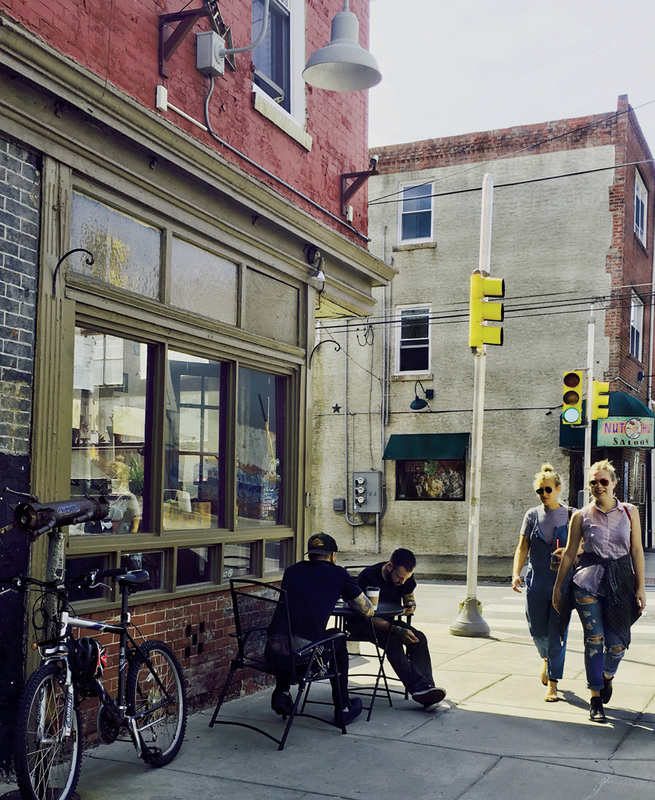 The Frankford Avenue Arts Corridor was now enlivened with bike racks salvaged from industrial machinery, smartly designed bus shelters, and an annual “energy” festival, with a slew of coffee shops, galleries, and art supply stores all with trendy names, the Rocket Cat Café, the Sculpture Gym. With the seven-acre site transformed from terrain vague to the Big Green Block, Front Street has become what a board member of the Fishtown’s community development corporation described as “the sharp boundary… where the real fight is going to happen.” 23 Residents of Norris Square are legitimately fearful of gentrification, especially those who can remember their expulsion forty years ago from the now fashionable Fairmount area. However, in their decades-long isolation in the Badlands, the NSCA managed to consolidate ownership and claim of the neighborhood’s strategic land resources. For-profit developers who know the value of green space have begun to swarm into Norris Square only to be frustrated by the barriers put in place to defend against displacement. 24 Venting on blogs, the would-be gentrifiers accuse the NSCA of hoarding properties some purchased cheaply from the city; others accuse the director’s protective stance toward securing an affordable culturally focused neighborhood as being close to racist. A river of green flows below the El. Temporary grass streets provide continuity across the Front Street divide. Image © Andrew Jacobs. Stitching together elements of diverse culture in informal event space. Image © Andrew Jacobs. 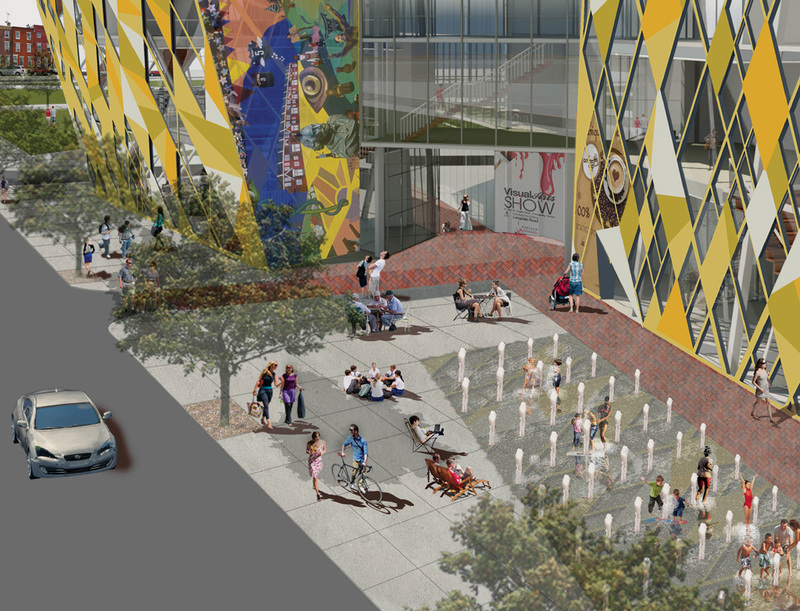 A proposed hybrid library/maker-space brings together elements of Norris Square’s literacy initiative and Fishtown’s art community. Image © Arjumand Anjum. A street-level public space and a passage through the building creates spatial porosity, connecting Front Street to the Norris Square Park. Image © Arjumand Anjum. The city, framed as oeuvre, as Lefebvre says, “is closer to a work of art than to a simple material product.” 26 In these terms, neighborhoods, especially those built through sustained grassroots efforts, may possess the underlying complexity to withstand exogenous forces if given representation. If designers expand their role beyond the consultant-client product/service-delivery model, they can act both as partners in a shared civic endeavor and as agents capable of representing and advancing the oeuvre. Redressing the banal heartlessness of gentrification can be viewed as a design challenge writ large, where principles of architecture, landscape architecture, and urban design can be brought to bear: context, spatial layering, growth, porosity, pattern, public-private interface, materiality, luminosity. 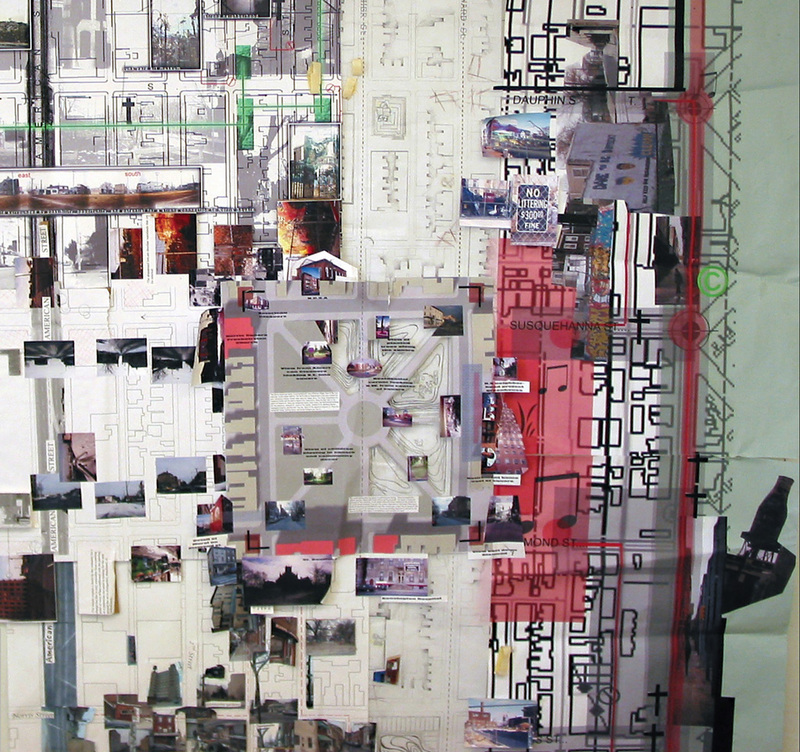 Designers can first employ their skills to help communities build a layered narrative of neighborhood spatial culture. This narrative can weave together practices and meanings inscribed in the physical environment, representing often hidden strengths – from the front stoop and the corner store that support social and economic interaction; to the multi-functionality of school and church buildings that give new meaning to neighborhood institutions; to patterns of connectivity; to homes that reconfigure to accommodate changing occupancy and informal businesses; to vacant lots and bounded streets appropriated for play and celebration. In the context of gentrification’s bent toward branding the neighborhood as consumable product, visualizing this kind of complicated – often messy – place-identity is ultimately a more potent platform for future development. It corrects asymmetries of power by framing a dignified expression of a collective presence saying: We are here; our neighborhood is valued as a place, not a site of exchange. Anchoring community identity a neighborhood map strategically identifies its topos of education and community institution. Image © Christina Guerrero, Vadislav Peji, Anna Delzingaro, Tien-Ho Lin. Image © Arjumand Anjum. 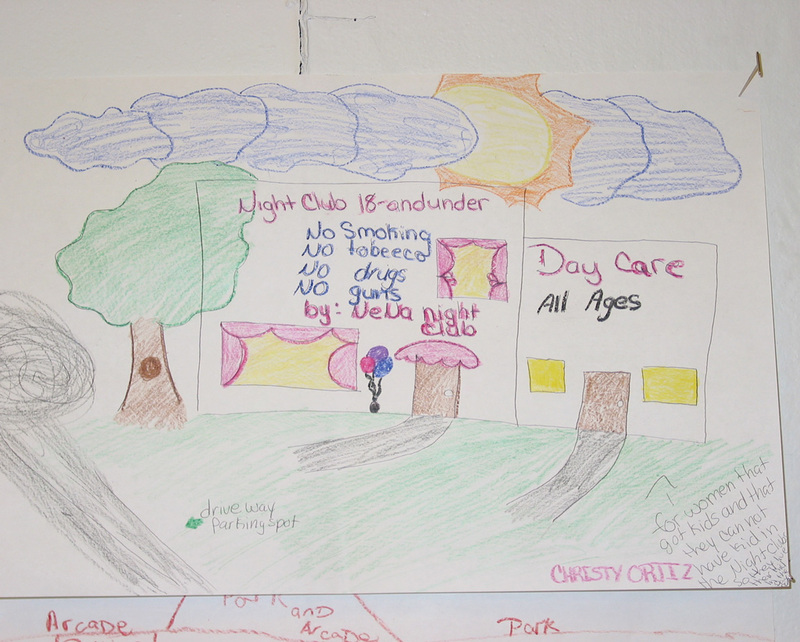 A hybrid institution- a daycare/nightclub proposed by a Norris Square teen parent. Image © Christy Oritz. When the complexity of lived space is valued beyond simple currency of exchange, a broader expression of the city as oeuvre is free to unfold. Now the goal is not just to preserve a community’s “right to stay put,” but having established a secure base, to serve the interests of the next scale of urbanism in the space where different communities overlap. Here, day-to-day contact with others’ spatial habits and expression accumulate. Sometimes highly ambiguous and fluid, the margins can be vigorously engaged, indeed celebrated, as sites of negotiation and contestation, where hybrid forms of collectivity are actualized. If together designers and communities are willing to engage with rather that flee from conflict, they can contribute to a broader authentic discourse on how we shape the city around shared values of a democracy. 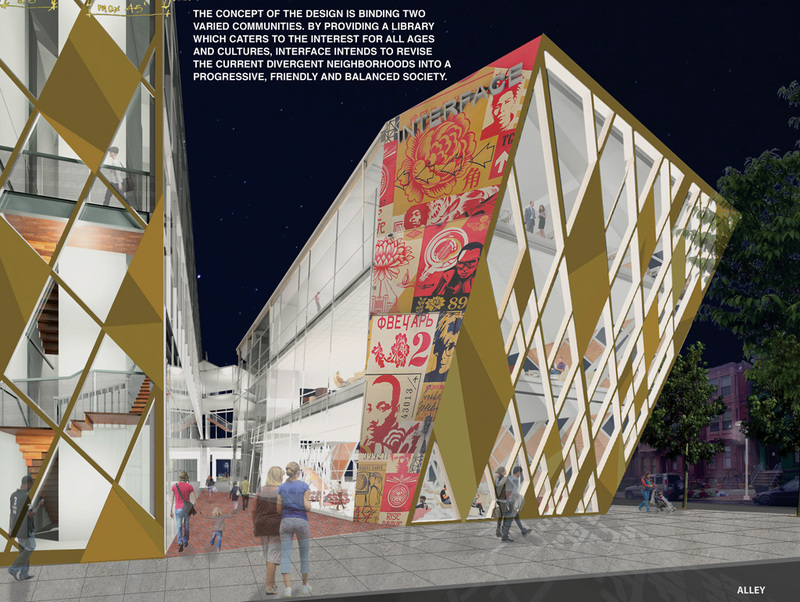 27Here designers are not accessories to a narrow agenda, but can orchestrate differing cultural perspectives and visualize spaces of encounter where a mosaic of multiple publics is represented on the larger urban stage. Henri Lefebvre, “The Right to the City” in Eleanor Kofman and Elizabeth Lebas, eds., Writings on Cites/Henri Lefebvre (Cambridge MA: Blackwell, 1996), 101. See: Neil Smith, The New Urban Frontier: Gentrification and the Revanchist City (London: Routledge, 1996); Loretta Lees, “Guest Editorial” Environment and Planning A 36 (2004): 1141-1150; Japonica Brown-Saracino, The Gentrification Debates (New York: Taylor and Francis, 2010); Sharon Zukin, Naked City: The Death and Life of Authentic Urban Places (New York: Oxford University Press 2010). Derek Hyra, “The Back to the City Movement: Neighbourhood Redevelopment and the Processes of Political and Cultural Displacement,” Urban Studies 52, no. 10 (2015): 1753-1773. See: Thomas Angotti, “The Gentrification Dilemma” in www.architectmagazine.com/design/the-gentrification-dilemma_o 2012 Venice Biennale; Thomas Slater, “The Eviction of Critical Perspectives from Gentrification Research,” International Journal of Urban and Regional Research 30 (April 2006): 37-757; John Joe Schlichtman and Jason Patch, “Gentrifier? Who, Me? Interrogating the Gentrifier in the Mirror,” International Journal of Urban and Regional Research. 38 (July 2014): 1491-508. See: Bryan Bell, ed., Good Deeds, Good Design: Community Service Through Architecture (New York: Princeton Architectural Press, 2003); Bryan Bell and Katie Wakeford, eds., Expanding Architecture: Design as Activism (New York: Metropolis Books, 2008); John Cary and Public Architecture, The Power of Pro Bono: Forty Stories about Design for the Public Good by Architects and their Clients (New York: Metropolis Books, 2010. ); and Kate Stohr, Design Like You Give a Damn 2: Building Change from the Ground Up (New York: Metropolis Books, 2012). Peter Aeschbacher and Michael Rios, “Claiming Public Space: The Case for Proactive, Democratic Design” in Bryan Bell and Katie Wakeford, Expanding Architecture, 87. See: Andres Duany, “Three cheers for 'gentrification',” The American Enterprise 3 (Apr/May 2001): 36-39; Richard Florida, The Rise of the Creative Class: And How It’s Transforming Work, Leisure, Community, and Everyday Life (New York: Basic Books, 2002) and Richard Florida, Cities and the Creative Class (New York: Routledge, 2005). Loretta Lees et al., Gentrification (New York: Routledge, 2008), 210. Lance Freeman and Frank Branconi, “Gentrification and Displacement: New York City in the 1990's,” Journal of the American Planning Association 70 (January 2002): 39-52. Lynne Manzo and Patrick Devine-Wright, Place Attachment: Advances in Theory, Methods and Applications (New York: Routledge, 2014): 141-153. Derek Hyra, “The Back of the City Movement," cit..
Brooke Havlik, “Eating in Urban Frontiers: Alternative Food and Gentrification in Chicago” (master's thesis, University of Oregon, 2013), 0171N_10846. Karen Wilson, “Building El Barrio: Latinos Transform Postwar Philadelphia,” Pennsylvania Legacies 3 (November 2003): 17-21. Patricia Haynes, “Philadelphia: A City of Neighborhoods,” in A Patch of Eden: America’s Inner-City Gardeners (White River Junction NH: Chelsea Green Publishing, 1996), 71-116. Personal Interview with Patricia DeCarlo, January 2015. Personal interview with Shanta Schachter, July 2014. 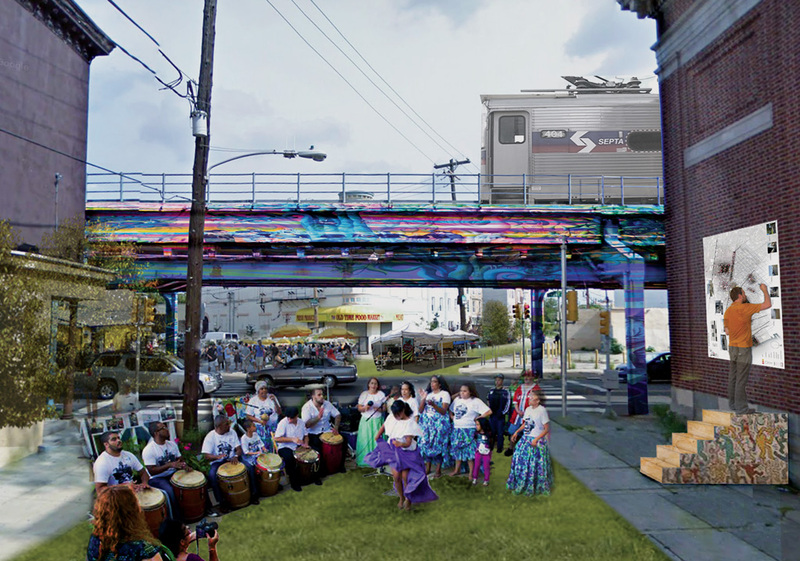 Group G, LLC., “Frankford Avenue Arts Corridor,” unpublished report, 2004. 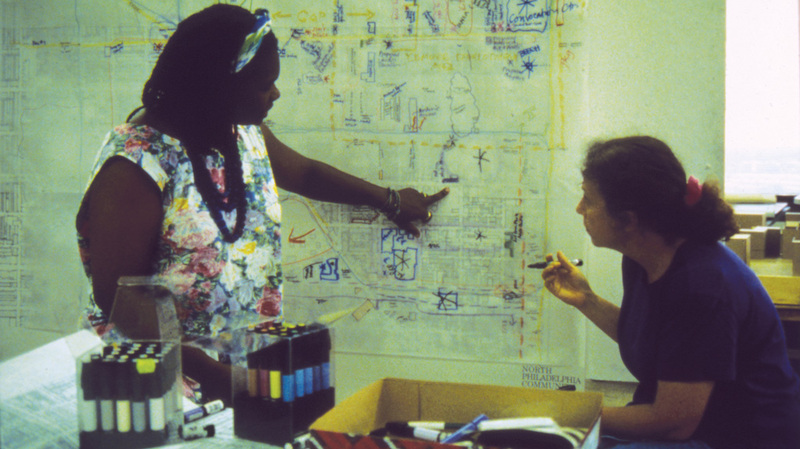 Karen Franck and Quentin Stevens, Loose Space: Possibility and Diversity in Urban Life (London: Routledge, 2006). Personal Interview with David Fecteau, July 2014. Personal interview with Wesley Casconne, January 2015. Interview with Patricia DeCarlo, 2015. Andrew Jacobs, “Convergent Dwelling: Neighborhood Identity and the Landscape Narrative” (master's thesis in Landscape Architecture, Rhode Island School of Design, 2014). Henri Lefebvre, “The Right to the City,” 158. Maria Ballesteros et al. eds. Verb: Crisis (New York: Actar, 2010), 168-180. The funding for research was through a Temple University Research Incentive Grant, and subsequent and future self-funded initiatives. This paper was presented at the 104th Annual Meeting of the Association of Collegiate Schools of Architecture in Seattle, Washington in March 2016 and published in the conference proceedings, Shaping New Knowledges (Corser Robert and Haar Sharon, eds., 104th ACSA Annual Meeting Proceedings, Shaping New Knowledges (Washington, DC: ACSA, 2016). Sally Harrison is Associate Professor of Architecture at Temple University in Philadelphia where she serves as Head of the Master of Architecture Program. Prof. Harrison’s expertise is in urban history/theory and social impact design. She is the leader and co-founder of the Urban Workshop, an interdisciplinary university-based collaborative undertaking research, design and design-build projects in underserved urban neighborhoods. Her work is published in books and academic journals and has been recognized in national and international design awards programs. Prof. Harrison received her Master of Architecture from the Massachusetts Institute of Technology. Harrison is lead author of the article, having conducted design and research for over a decade in the neighborhoods discussed, and most recently on issues of gentrification. Andrew Jacobs, Assoc. ASLA, is a Landscape Designer with SALT DESIGN STUDIO in Philadelphia. He has worked overseas and in Philadelphia: training members of a farmer’s cooperative in agroforestry techniques for the Peace Corps in Togo, West Africa; researching historic agricultural and settlement patterns on Easter Island, Chile; and investigating neighborhood identity in Kensington, Philadelphia. Critical to his design thinking is the link between large-scale systems and localized interventions. Andrew graduated with a B.A. in History from Bates College and an MLA from Rhode Island school of Design. E-mail: andrewjacobs2@gmail.com.